Kelefa Sanneh asks ‘what was Ronda Rousey thinking‘ in the New Yorker. Daniel Taylor on Tony Wilson’s needling of Liverpool on TV and the relationship between two of English football’s heavyweights. Sports Illustrated’s Richard Deitsch talk to female sports reporters about their safety, in the wake of the Erin Andrews stalker court case. Paul Hayward in the Telegraph argues why Maria Sharapova does not deserve sympathy. 5. ”Jesus was the inspiration, but it took a small army of evangelists to turn his radical ideas into a big religion. This model—of a towering central figure and a host of followers and interpreters—is still a pretty good way to transform the world. It works in small ways as well as big ones. For example, Sigmund Freud and his students, rivals and successors changed the way we understand the mind. Karl Marx and his readers shaped the 20th century. Surreal modern British comedy wouldn’t exist without Spike Milligan and his host of admirers and successors. If you read one piece this weekend, treat yourself to this David Winner work of art on one of Dutch football’s greats. Email “The cult of Cruyff and all our favourite sports writing this week ”. 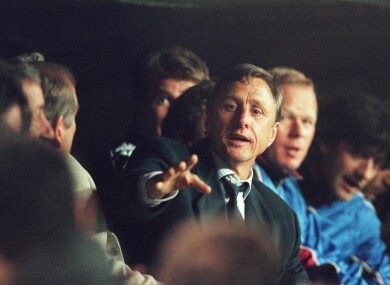 Feedback on “The cult of Cruyff and all our favourite sports writing this week ”.